Cold Hawaii is not a single surfing spot, but 31 registered surfing spots that are all located on the west coast of Thisted Municipality. North Cold Hawaii is bounded by Viksoe Rallejer and the Hanstholm coastal slope, and in the south by the Agger Tongue. 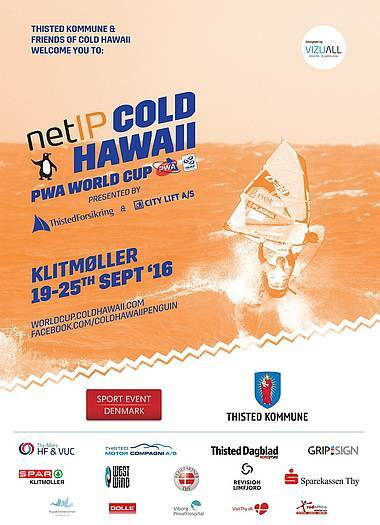 The netIP Cold Hawaii PWA World Cup is held at The Reef, located in Klitmøller—better known as the capital of Cold Hawaii. Klitmøller and Cold Hawaii is part of Thy National Park. The characteristic and unspoiled dune heaths have been created by the sea, the wind, the salt and the sand. Large plantations and some of Denmark´s cleanest lakes complete the picture of Denmark's largest wilderness. A perfect place for plants, birds, animals and humans who enjoy a lot of space, high skies and lots of fresh air. The extent of the dune heaths in Thy National Park, you will only find at few other places in Europe. The nomination to status of a national park guarantees the protection and preservation of the dunes and the dune heaths for the future.